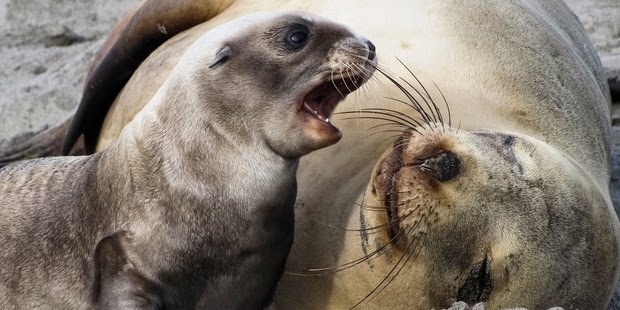 The secret of sea lion slump population in New Zealand allegedly hidden in their teeth. That's why, researchers are aggressively seeking out the particulars of the problem. Dr. Brittany Graham, from the National Institute of Water and Atmospheric Research (NIWA), said that the sea lion teeth have a bond that grows every year, similar to a circle on a tree trunk. "By taking a small sample of the bond and then prepared for stable isotope analysis, researchers want to know what is eaten by sea lions, where the sea mammals for prey and whether the conditions of the oceans change their life," she said as reported by Xinhua on Monday, April 28, 2014. New Zealand sea lions were hunted on a large scale in the 18th and 19th Century and in 1997, the marine mammal species declared as endangered with only 10,000 left. The sea lions have two breeding colonies, one in Auckland Islands and the other in Campbell Island, both in the sub-Antarctic waters. Although the population of sea lions on Campbell Island survive, the colony at the Auckland Islands had declined over the years, and several studies conducted to identify the cause of the deterioration. "These teeth will provide information not only about whether ocean conditions have changed over time, but also whether there has been a change in the network structure of food in the ocean," said Brittany Graham.